Board has released post in ALP/ NTPC/ JE/ Technician Gr III/ SSE/ ASM/ Typist Posts. ALP/ Technician Gr III/ NTPC/ JE/ SSE/ ASM. Qualifications : 10th/ 12th/ ITI/ Diploma/ Graduation. 1. Firstly, visit the official website that is www.rrbahmedabad.gov.in. 2. 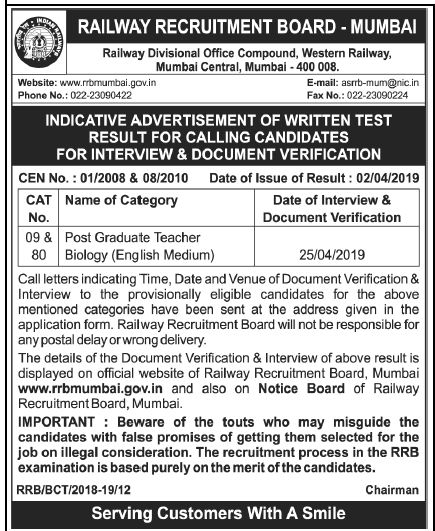 Then check all latest RRB Recruitment notifications on the home page. 3. Click on your desired information. 4. Analyze all instructions and conditions issued by the RRB Ahmedabad Board. 6. Fill the required details without any mistakes. 7. Upload the required documents, photo, & signature within specified sizes. 9. Finally, click on “submit” and then print the application form for future use.